Full Year turnover up 17 per cent to AED 3.7 billion on rising passenger numbers and network expansion program. Air Arabia announced today its financial results for the full year ending 31 December 2014, reflecting another year of continued growth and high levels of profitability. Air Arabia reported a record net profit for the full year ending December 31, 2014 of AED 566 million, up 30 per cent compared to AED 435 million for the same period last year. The airline’s turnover for the full year 2014 reached AED 3.7 billion, an increase of 17 per cent on 2013, driven by increased passenger numbers. Air Arabia carried over 6.8 million passengers in 2014, 12 per cent more than last year. The average seat load factor – or passengers carried as a percentage of available seats – for the same period stood at an impressive 81 percent. 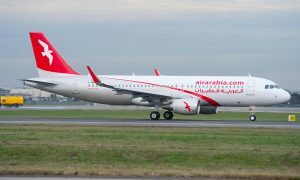 These results were announced following a meeting of the Board of Directors of Air Arabia, who have proposed a dividend distribution of 9 per cent of capital, which is equivalent to 9 fils per share. This proposal is subject to ratification by the shareholders of Air Arabia at the company’s upcoming Annual General Meeting. “The year 2015 continue to witness political uncertainty in some parts of the region and with the current fluctuating fuel prices, the pressure on the global economies is increasing. Despite the regional and global economical and geo-political challenges, we remain highly confident about the long-term prospects for our business”. 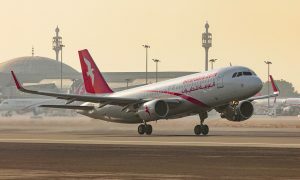 Air Arabia’s net profit for the fourth quarter, stood at AED 68 million, a drop of 28 per cent compared to AED 94 million for the same period last year. The drop in the fourth quarter 2014 was mainly due to a temporary downward correction in the fuel hedge portfolio, which will regain its benefits going forward. The airline’s turnover for the last quarter of 2014 was AED 924 million, an increase of 14 per cent compared to AED 811 million reported for the same period in 2013. Passenger traffic for the fourth quarter 2014 reached 1.7 million, an increase of 8% compared to the same quarter of last year. Now in its eleventh year of successful operations, Air Arabia operates flights to 101 destinations. 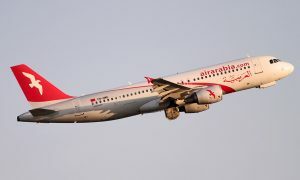 Air Arabia has seen its flight network expand substantially with the addition on prominent new routes, such as Cairo in Egypt and Antalya in Turkey, from its main base at Sharjah International Airport. The carrier now operates from five international hubs, including the UAE (Sharjah & Ras al-Khaimah), Morocco, Egypt and Amman, Jordan. In the first half of 2014, Air Arabia opened its fourth international hub in Ras al-Khaimah.